An out of universe example. In interviews featuring both Tommy Wiseau and Greg Sestero, it's clear that Greg is fully aware that Tommy is kind of a nutjob, and that The Room is a hilariously awful movie. However, it seems like he's far too kind to actually say anything about it, and has remained friends with Wiseau for all these years, whereas many of the other actors have understandably not kept in touch with him. Power of friendship, right there. Even the supposed creepiness of their friendship as it is described in "Disaster Artist" book doesn't change this being a heartwarming example. And Tommy himself clearly loves his fans, even if he's not sure why they're laughing at his movie. Another out of universe example. At the midnight screenings, the audience participation is just fantastic. A good example would be here, where an entire room of people all the say the exact same famous line at the same time...it's glorious. Here's another. The entire audience giving the same level of cheering to Denny eating an apple, that you'd usually hear at a football game. Johnny's and Mark's constant statements about being best friends, when you know Wiseau wrote the part specifically for Greg Sestero, his only friend. When Denny confesses to Johnny that he's in love with Lisa, Johnny assures him that Lisa loves him platonically, and that the world would be a better place if more people cared about each other. He also encourages him to make a life with his girlfriend Elizabeth. Johnny giving the flower shop dog a brief head-pat before departing. "Hai doggy!" It's a meta moment of heartwarming as well. 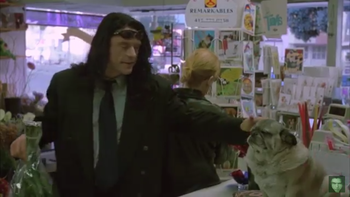 The moment that Johnny greets the dog is actually the very moment Tommy Wiseau noticed the dog was there, several takes into shooting the scene. It's a perfect exhibition of Tommy's well-hidden sweet side. Apparently, the dog got paid $100 for being in the film..
Their scenes are repetitive, and their personalities are unpleasant, but it's nice how Claudette pokes Lisa's nose every time they say goodbye, something only a mother could get away with. The "I put my evil in you" meme it inspired at screenings may affect this somewhat.